1. Preheat the oven to 220ºC, gas mark 7. Line a baking sheet with foil. Rub the spices and oregano into the salmon and place on the baking tray. Spritz lightly with oil and roast for 15-20 minutes until browned and cooked through. 2. Meanwhile, in a large bowl, mix together the yoghurt, mustard, dill and juice of ½ the lemon. Peel and shred or coarsely grate the celeriac, adding it to the dressing and turning to coat it as you go. 3. Cut the remaining lemon half into 4 small wedges. 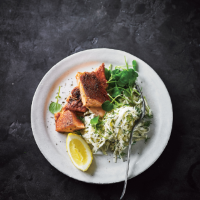 Divide the salmon, celeriac salad and watercress between 4 plates and top each with a lemon wedge. Cook’s tipCeleriac browns quickly so toss it with the dressing as you go along to prevent discolouration.